Welcome to 'Natural Chemistry', the fanlisting listed at TheFanlistings.org for the relationship between co-stars and friends, George Clooney and Brad Pitt. TheFanlistings.org states that relationship fanlistings "are to cover all aspects of the relationship", and the term 'relationship' is used in the broadest definition of the word. I've built this little site because I love watching George and Brad's onscreen chemistry (in the Ocean's movies), and in the interviews that they have given (See the video clips pages and magazine interviews page for examples of this!). They appear to be great "showbiz friends", and have a chemistry that is lovely to watch. The George Clooney & Brad Pitt fanlisting was last updated on 29th March 2019. There are 60 fans listed, with 0 waiting to be added and the newest member is Kathryn. 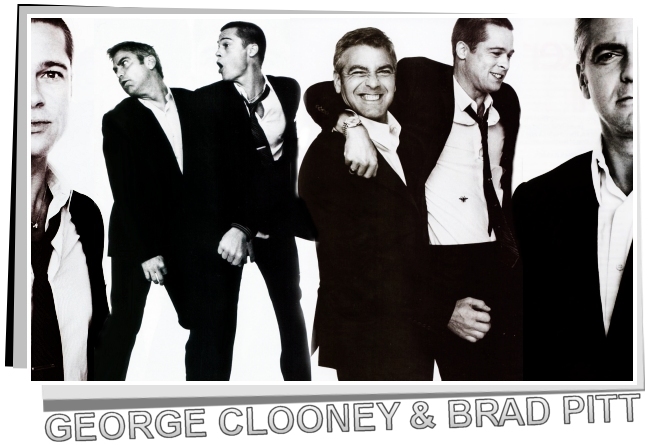 The George Clooney & Brad Pitt fanlisting was created on 16th May 2006 and uses the Enthusiast script.